Problems running Gamesalad — Welcome to the GameSalad forum! Gamesalad freezes continuously and I have to force quit. It also sometimes shuts down of its own accord. 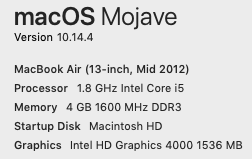 -upgraded to Mojave so that I could download Xcode. I'm working on a MacBook Air mid 2012. Wonder if I just need a new computer? Which version of GameSalad are you using? I'm also having a problem signing my App when publishing. 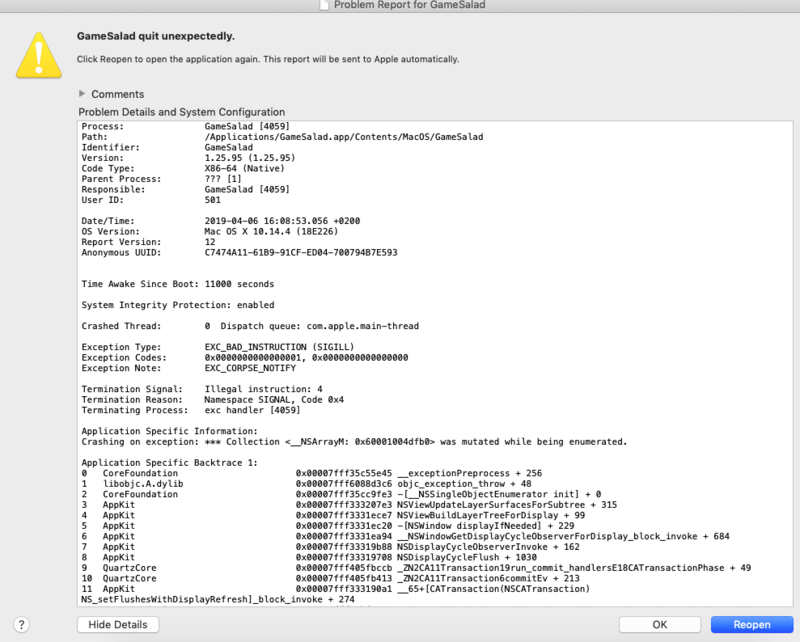 I'm running Xcode Version 10.2 (10E125). I'd be very grateful for your help. 2012 not bad. Mine even older 2011. I’m using gamesalad 12.5.95 Mac Sierra High xCode 10.1. I signed mine with build rc and had some errors at the beginning. After spoke to @adent42, I got mine worked. What’s your iPhone iOS version? My iPhone 6s IOS version is 12.2. How did you get past the error @AlKaPP? @adent42 is there a way around? I didn't have the iPhone SDK problem. I got problem with the application loader (Xcode 9.x) and generated my app with the normal generator. After upgraded the Xcode to 10.1 and generated with the RC Build. The problem solved. My phone IOS is 11.4. So actually all of your versions are newer than mine. I did have other errors too but it was just about missing app icon, uploaded the zip file instead of ipa, and some other small bugs. It was very frustrating to track down the issues since sometimes they gave us the error message like "missing asset catalog" but it's actually missing an app icon. Sorry for a long read but still not getting you direct help with your error. What I'm trying to tell you is that you might not need a new computer now since my even my older computer works fine. Hopefully it's just a blip that will soon be sorted. I updated xcode to 10.2 and have the latest version of gamesalad. I'm trying to sign and submit to apple and i'm getting this error with the red x. @Goodnight Games yes I got that error. Try to generate your app using the Build RC button would take care that error. Let’s me know if it works for you. @AlkaPP nice it went through to application loader just fine and didn't get the error. now will see if i run into any other errors lol. thanks a lot. @Goodnight Games all good? 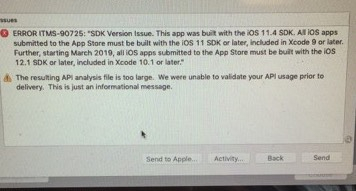 Did you get your app successfully uploaded to your itunesconnect? ...when I try to sign the provisioning profile certificate. Hello, my game works fine with the Gamesalad Viewer on my iPad but not on my iPhone...is this related to the SDK error?? @patricia.brady can you show me how to test my app on viewer? I tried last time but the viewer 1.25.80 doesn’t work on the new version of Gamesalad creator. @AlkaPP just download the Gamesalad viewer from the App Store to your iPhone/ipad... when the device and your mac are on wifi and an icon will appear next to the Gamesalad Creator Preview button, you just press this, and hey presto you're off! ...sorry @AlkaPP I don't know how to help...hope someone else can. Anyone else having this problem? I've been staring at the spinning wheel for over a week now. What’s the RAM of your laptop? this is the mac i have at the moment and recently updated the os. its not exactly the same problem as yours, but game salad preview has been severely slowed down. i can't even click on buttons with out it freezing for a bit. it usually takes me a 10+ clicks on a menu button just to navigate through. trying to figure out how to deal with this at the moment. Same here. Makes working nearly impossible. @adent42 Any ideas on what's going on?